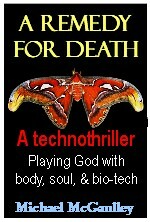 It drew my eye because of the link to some of the activitiy in my medical technothriller, A REMEDY FOR DEATH: Playing God with Body, Soul, and Bio-tech. The article also picks up on a new book by Janet Radcliffe Richards (the Oxford Professor of Practical Philophy! ), entitled THE ETHICS OF TRANSPLANTS: WHY CARELESS THOUGHT COSTS LIVES. The overall points raised revolve around when is it legally/ethically acceptable to "declare death," in order to remove organs for transplantation to someone who needs them? Yes, those organs can save lives, but what if--what if--the donor isn't quite finished living? Which brings us to another article, "Organs taken from patients that doctors were pressured to declare brain dead: suit "
That appeared first in the New York Post, September 26, 2012, and was picked up quickly in several other spots. The lawsuit cites four examples of allegely improper organ harvesting. In one of them, a drug overdose victiim's body was about to be "harvested" when one of the attending nurses noticed that she "was being given 'a paralyzing anesthetic' because her body was still jerking." In another case, cited in the suit, a 19-year old auto accident victim was allegedly "still trying to breathe and showed signs of brain activity, the suit charged. But doctors declared hm brain dead under pressure from donor-network officials. . . "
Hmm, better stay safe till the doctors and lawyers and judges (and no doubt legislators will chime in, as well) get it all worked out. Or will the issue ever be settled?